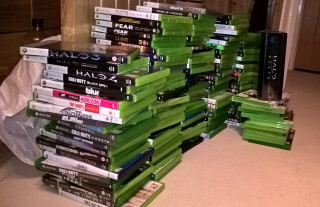 In the ever-rolling quest to clean up after myself, tonight I ended up collecting and cataloging all my physical Xbox games. 139 boxed, mostly Xbox 360. Because I’m a lame nerd I also made a spreadsheet of them all so I don’t buy dupes. Oh dear. Any recommendations you don’t see on the list and that haven’t been given away via GwG? Let me know!